Noting that in this day and age, building in wood seems to have taken a backseat to styrene and other materials. There was a time when wood reigned supreme and there were a great number of kits and materials. I still have a goodly supply of various sizes, shapes and specialty items. The original firm, Northeastern, machined basswood into various shapes and sheets. They also manufactured complete kits for various companies who in turn sold the products. Over time the demand especially for O Scale parts dropped and then became obsolete. Then about ten years ago the company was divided and sold. The structure portion went to California, and the lumber portion stayed in Massachusetts, now in the hands of a couple of fellows whose primary business is cabinet making. They have revived just about all of the original line as far as O Scale is concerned and have added new products such as corrugated aluminum. It is definitely worth a look on their website at http://www.northeasternscalelumber.com. They maintain a retail store as well. One product in particular that I want to mention is the wood glue product that they now market called Pink Flamingo. It has all the features that one could desire, such as quick tack, rapid cure, and good control. They offer a kit which includes extra glue, a flexible dispenser bottle and a couple of stainless nozzles. 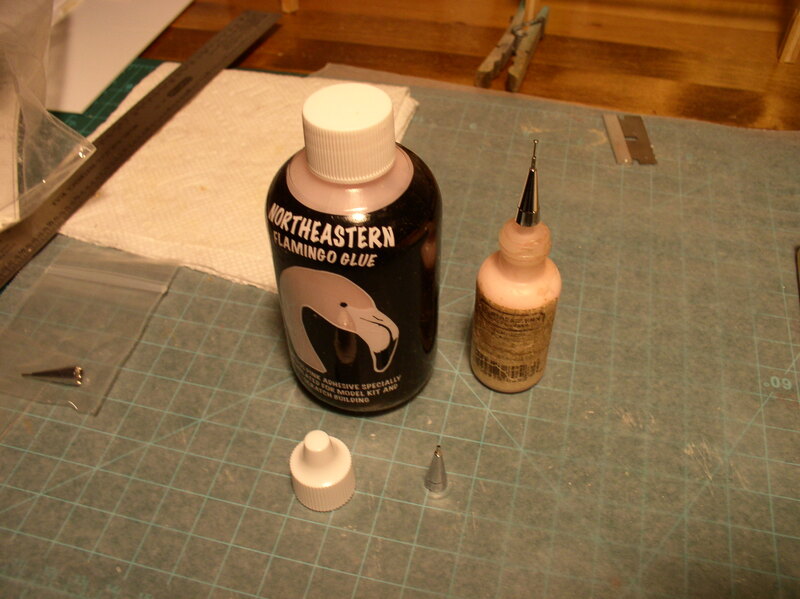 The nozzle and small squeeze bottle are a great combination for good application control, making fine beads of adhesive possible. Instructions indicate that the nozzle should be rinsed out after use, but I have found inserting a pin or wire into the nozzle between uses is much easier and will maintain the opening for quite some time. That’s my modeling tip for June…. It’s nice to be back at work on the railroad after a three week trip to New England for some family events. Spike and tie plate work is being conducted at both Calais and Ayers Junction, depending on what I feel like on a given day. Most of that type work is winding up in Calais leaving primarily switch construction to be completed. Because of the ridge in the foreground of Calais, I have opted to control the point movement with servos. There is nothing wrong with the slow motion switch machines I have used in the past, I just would like to try out the servos. The photo shows a servo mounted on a bracket that is laser cut and glued together. Both of these items plus the control boards come from Tam Valley Depot. The bracket is mounted underneath using a self adhesive foam pad to aid in the initial centering. Once satisfied, the bracket can be secured with a couple of screws. There is a slot cut between the two head block ties. Painted black makes it difficult to see. The control rod is first centered and then brought up through the slot to reach a hole in the switch throw rod. 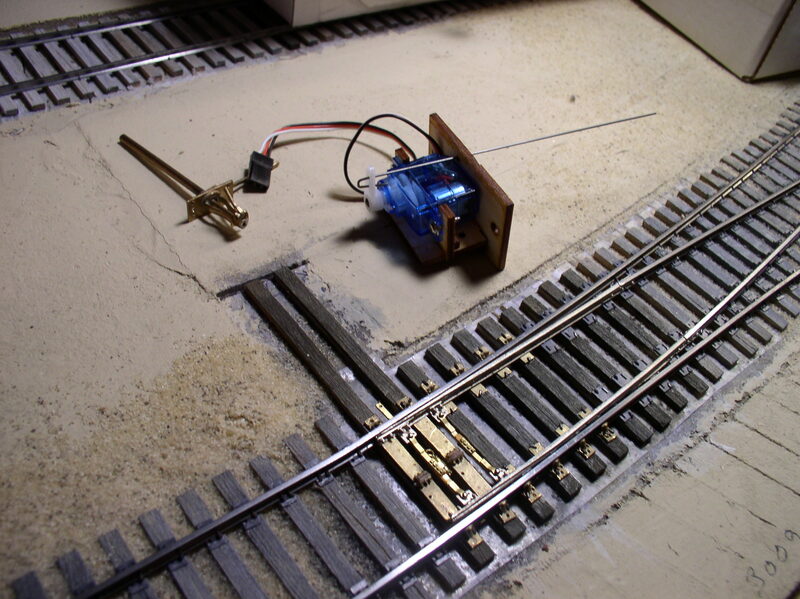 The servo then is put through a control routine that determines the movement of the points in both directions. The switch stand shown has been modified to have its rotation driven by the control rod. The switch stand is an operating model by Red Cliffs Miniatures. Normal operation is by lifting the handle and rotating it 90 degrees and then placing the handle into a locking slot. The modification has removed the slots at both ends of the rotation, allowing the handle to swing freely. The final adjustment will be to check the rotation and make sure it is 90 degrees. This is because a ball and arrow target will be mounted on the stand as an indicator of switch position. It seems like every time I go over my stack of photos I notice something new. This time I discovered that there was a shed between the depot and the train that protected passengers and their baggage. Since Calais was pretty sparse when it came to structures, I thought I would add this one into the mix. 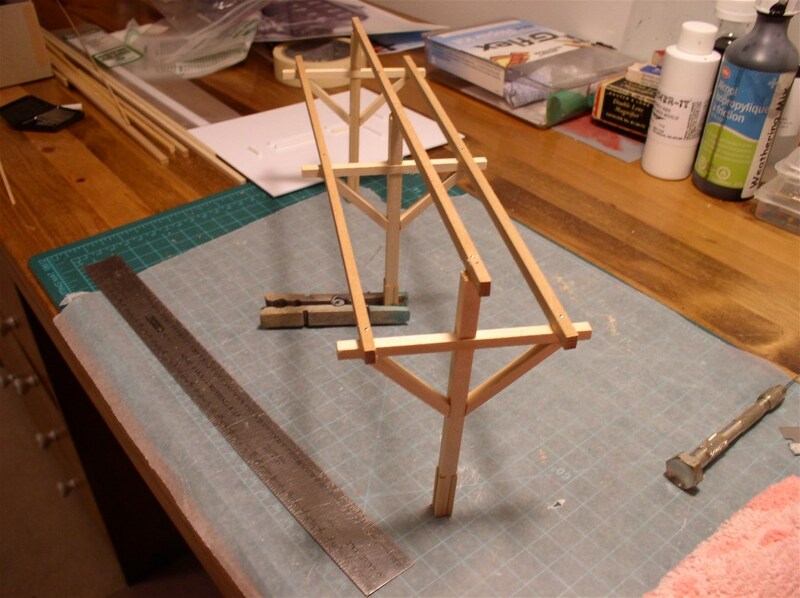 A simple styrene jig to make the supporting trusses uniform and I was in business. The roof work is yet to come, but first I need to test mount the frame into the space and make sure it all fits. As near as I can tell, this shed was eliminated along with the passenger service to Calais. Photos taken a few years into freight only service show no evidence of the shed existing.